Until 1992 the International Eisteddfod was staged in a giant tented structure raised specially for Eisteddfod Week. That mighty tent was as much a past of the Eisteddfods humble character as the green meadow grass growing beneath the feet of audiences. Inside the tent it was an effort of will to concentrate on goose-pimpled ballerinas hopping about the stage, or, blue-nosed conductors trembling before their choirs when distracted by the ominous gyrations of the canvas roof, or, by the creaking of king-posts swaying like the masts of galleons heading for the reefs. By the early 1980’s Llangollen’s success brought problems. Not only were the huge increases in the numbers of competitors and visitors creating strains upon the Eisteddfod’s primitive facilities but other music festivals, boasting modern highly sophisticated facilities, began to be established in competition. 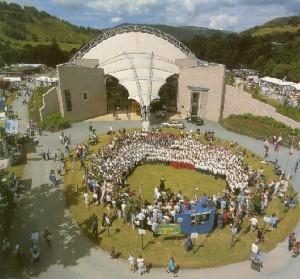 In 1985 a special Development Board, representing the International Eisteddfod, was given the task of raising £500,000 to finance the construction of a modem International Eisteddfod complex. At about this time Clwyd, Glyndwr and Llangollen Councils, The Wales Tourist Board, The Welsh Development Agency, Clwydfro R.E.T. and the Eisteddfod, (known as the ‘Partners’), were pondering a report commissioned from Land Use Consultants of Liverpool. LUC’s brief was to consider if the International Eisteddfod’s need for improved accommodation could be exploited to enhance Llangollen’s already great importance as a tourist destination. The conclusions drawn by LUC were that a flexible 5,000 seater building in such an attractive location would generate its own market because of the sheer size of the space on offer. The project gained instant credibility in the Spring of 1989 when the Wales Tourist Board produced a plan awarding Llangollen LEAD resort status. The document included a proposal for the International Eisteddfod to establish permanent facilities for the exclusive use of the Eisteddfod for 4 weeks in the year. For the other 48 weeks the complex and its facilities would be available for regional use. The Eisteddfod agreed to lease their site to Clwyd County Council, (the project developers), for 99 years at a peppercorn rent and provide a capital sum of £500,000. The new complex has been designed to be flexible in use and in deference to the traditions of the International Eisteddfod employs permanent lightweight materials, sculpted to resemble a giant tent. The permanent ‘core’ building, constructed in traditional materials, houses a 400 seat theatre with backstage services which include modern changing-rooms, hot showers and catering facilities. Extending from the core building is the permanent 1,500 seater Eisteddfod auditorium enclosing a vast stage. A temporary seating area for a further 3,000 people is created by attaching traditional tenting structures to the auditorium. In 1985 former President, launched a £500,000 Development Appeal almost as a parting gift to incoming President Lord Hooson. This, by any standard, was a major fund-raising undertaking. The man entrusted with the unenviable task of raising it, as chairman of the Development Board, was Robert W. Manners of Bryntirion, Corwen, a relative of the founder President Sir Clayton Russon. Hundreds of personal letters were sent to businesses, authorities, choirs and individuals. He and his board organised presentations, covenants, press and radio appeals. Despite the adverse financial climate the targeted half million was finally achieved and formed the Eisteddfod’s cash contribution to the pavilion development.